Yacht Design and Marine Engineering office with a proven track record of high profile projects and the flexibility to adopt to the client's requirements. Recent projects include Shamrock V, Adix, Holland Jachtbouw 140' Schooner together with the recent series of the Moonen Schipyard stylish Motor Yachts. Web Site Snapshot: If available, above is a snapshot of the Stolk Marimecs BV web site at http://www.marimecs.com as it appeared when this site was added to the directory or last verified. 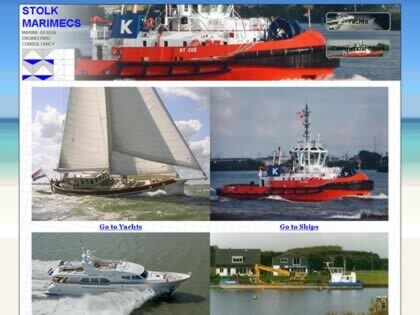 Please Note that Boat Design Net has no involvement with the above web site; all content and images depicted in the above thumbnail are the property and copyright of Stolk Marimecs BV unless otherwise noted on that site. Description: Yacht Design and Marine Engineering office with a proven track record of high profile projects and the flexibility to adopt to the client's requirements. Recent projects include Shamrock V, Adix, Holland Jachtbouw 140' Schooner together with the recent series of the Moonen Schipyard stylish Motor Yachts.